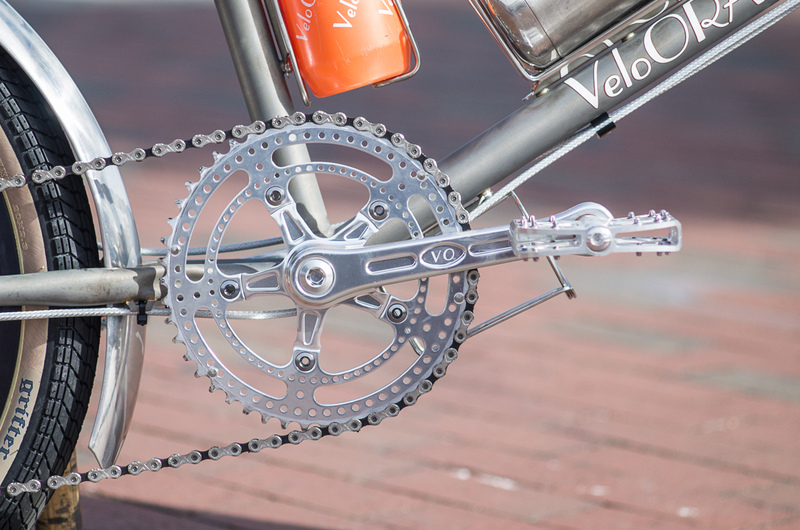 The Velo ORANGE Blog: Introducing the New Velo Orange Small Wheeler! Do you know what sizes will be available? I'd love to see something that fits similarly to a 61 cm "normal" bike. There are hardly any small-wheeled bikes out there for tall guys. Want! What will be the final cost and can we put down money for one now? I love it. I would also love the same frame, but takes 26x2.3 / 650Bx50 with fenders. I second saxifrage's sentiment. I was interested in the Soma Mini Velo years ago, but I ride a 58-60cm frame and they didn't go that large. Working at a cargo bike shop in Seattle, I'm VERY excited about the possibility of a wide 20" VO fender! We've been chopping and reshaping your 26" fenders to 20" wheels for a couple years now, but a dedicated plug-and-play option would be amazingly nice! Wow. I've wanted a bike like this since I visited Japan last November. Personally, I find the Small Wheeler beautiful! Using the Ritchey Break-Away system on this frame would really make a compact package! I'd also be interested in something that fit like a 61cm. Looks good with the pink decals on unfinished frame. I love mini velos! I had a Dahon Smooth Hound that I transported in the back seat of my old Honda Civic by simply lowering the seat. I never understood why these 20" minis never caught on in the US. Hopefully this bike will be the catalyst to change that! This is a real interesting choice for a new offering. I actually just got a used 2002 Dahon Boardwalk single-speed folder that I'm using similarly to how it seems like VO imagines folks will use the Small Wheeler. The Boardwalk fits in the trunk of my car (could the Small Wheeler do that requiring minimal re-assembly?) so I can easily park in non-metered spots on the periphery of the downtown area where I live and still get to work/events/etc. on time, and it's absurdly easy to take in and out of my apartment compared to the full-sized bikes I have. It also has the hardware needed for running a geared setup if I want to do that in the future. But the Boardwalk lacks things like disc brakes, bottle cage/front rack mounts, and ability to mount regular handlebars to an adjustable stem, which would be really nice. And it also only clears 20x1.75s and suffers from the quirky handling mentioned here-the deal-breakers that prevent it from becoming the first choice among the five bikes I currently own. So yeah, I think it'd be super cool to have a small-wheeled bike that preserves all the good features in a full-sized one. But while that would be cool... as someone who would really like to travel with a bike but hasn't done so before, I don't think I'd pick this to start-and especially not when just the frameset will run ~$725 (note: part of the price may well be due to the tariffs that the Trump Admin is putting on imported steel, which is VERY annoying). 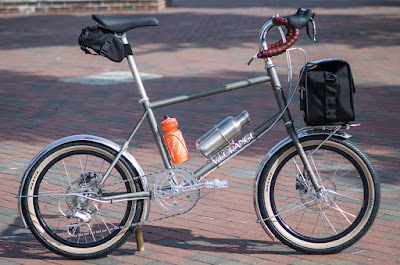 I could spend ~$700 on a midrange folder that would be as portable as this bike, have about 80% of the features it offers, and not need to buy 20in wheels, disc brake levers/calipers/rotors, and a shifting setup (Alfine, anyone?) to complete the build. Some folks' parts bins might have a lot of that kind of stuff sitting around, but mine sure doesn't. Still, I like VO and I'll be on the lookout for comparison reviews of this thing. I'd need a good sense of how the Small Wheeler rides compared to a midrange or luxury folder (Mariner D8 and/or one of the more basic Bromptons) before seriously considering it as a travel bike, and to a full-sized bike (maybe a Polyvalent or a Campeur) to consider it for general use. Till then, I'll be more than happy with keeping my Campeur as my daily rider and and considering how I'd reconfigure the Boardwalk if I wanted to stick it on a bus/train/plane and do an overnighter on it once I reach my destination. 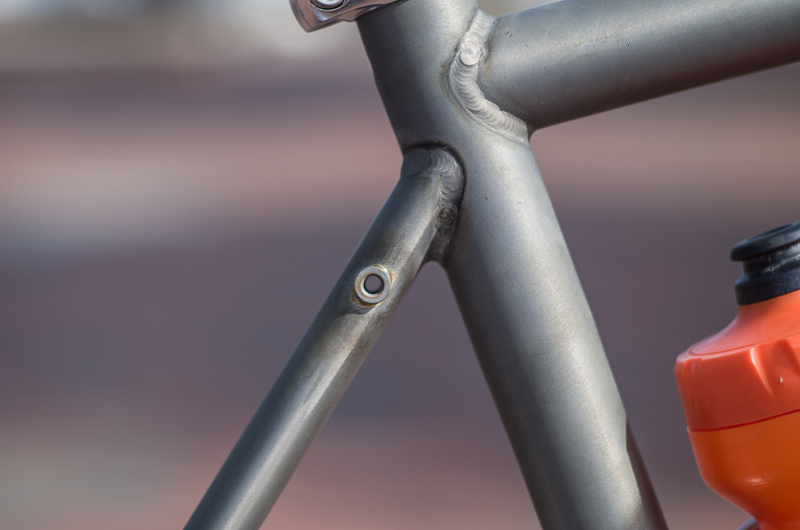 Since your prototyping, have you thought about adding a braise-on on the head tube like a Brampton or Dahon? 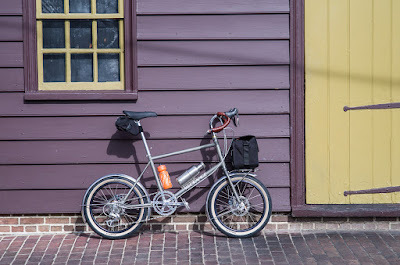 I have a Dahon Bullhead diamond frame, and use a Brompton adapter to run Brompton bags. It really works well as the weight of the bag is not carried by the front wheel off work, and doesn’t affect staring it all (which can be worse on small wheel bikes when weighted with a bag and rack). A small add that can add huge value for commuters like myself. This is just a dream machine - love it really! Would be great to get it with the option to use belt (gates) drive system. Then it woudl be perfect for a traveller bike build with an Alfine 11-speed DI, everything clean and easy to handle in trains oder packing into the bag. Have you seen Frances Cycles 20" fenders? Can by purchased directly, or through Merry Sales. I use on on my Soma Tradesman's front wheel! How do I get a test ride on the mini velo?? Looks super fun. 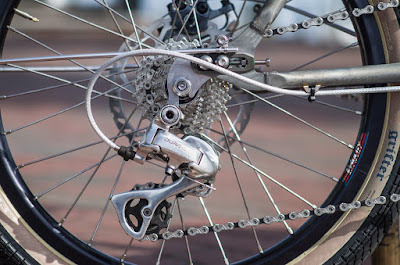 Any provision for a front derailleur? In my experience I really like having a double on my (Mercier Nano -based) mini-velo. It allows me to use a short-cage rear derailleur which keeps the derailleur further from road muck and damage, but still gives good range (vs. going 1x with a huge cassette and mountain longer-cage RD). Nice work on the 2.3+ fenders that is one area that current minis are definitely lacking. I vote for the production frameset having a looong steerer so that the buyer is not forced into using an LD stem. Using a massive spacer stack allows more freedom in stem choice and also gives room for spacer-mounted accessories. Also makes it much easier to adjust bar height when loaning the bike to friends of different heights -which is another area mini-velos are very good at. I second what Roman Moser said regarding adding an option to use a belt drive. It would make the bike perfect for easy travel and maintenance. I've been riding on a cheap Sundeal v2 that I picked up for about $250 and have had lots of fun tweaking but have found the frame and 451 tire size rather limiting. I'm glad to hear that VO is basing this frame on the more versatile 406 tire size with disc brakes and tons of braze-ons for accessories. Please please add option for adding a belt. Btw, it seems that mini velos are making another attempt in the U.S. with this and the forthcoming return of the Soma (New Albion) mini velo. This is a super super coincidence. I have been meaning to ask if VO was considering offering 20" versions of its fenders. I don't need another small wheel bike but I would love to have some hammered fenders on the 6 bikes I do have. They look a little frumpy in plastic fenders that are too short next to my 26" and 700c bikes that wear full coverage VO fenders :). An elegant 20" fork with a long 1" steerer would be nice too as would other components geared to small wheel bikes. I'll echo what has already been said--please consider making a version for taller riders! It's an underserved market. Soma (New Albion) is the only other builder making a viable mini, and their larges offering is a 55cm. Would love this in a softtail version. Love! I've been looking at some smaller wheeled bikes for a while and this clicks almost all the boxes - external cable routing, BMX wheels, disc brakes, gear options, lots of braze ons for attaching things. The only thing I would like to see is the ability to run a larger front platform on the front, something like a porteur rack or a Surly 24 Pack up front. With that smaller front wheel, the weight would be down nice and low and stable. Yes would like to see more front luggage experiments. Reminds me that my Brompton has horrible riding quality but incredible capacity for front loads. Fantasizing about this outfitted with something like a Specialized Pizza Rack... pseudo lowrider setup? Ok, cool! I have a Bickerton (probably Dahon) folder with 16" wheels, and although I'm used to the handling and can descend confidently, it is admittedly squirrely. Also, with 16" wheels it needs higher gearing even after changing the chainring to a 58 tooth! Great idea. 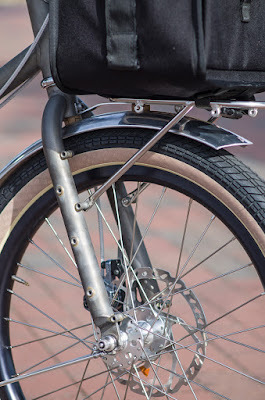 I strongly support a steering tube brazeon for a bag as it actually improves steering and suggesta long wheelbase, say 1028 mm so the ride is smoothed and more handlebar choices are available. I would go with vbrakes and an IGH because derailleurs and disc brakes are low to the ground on small wheel bikes. 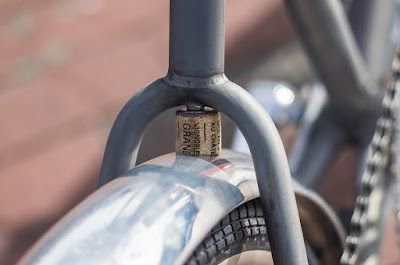 If you add a tab on each side of the seat tube the QR from the wheel hub could clamp on and hold the wheel in place for compactness and easy transport. A Rinko headset could also help with packability. Such a bike could broken down very quickly by releasing the brakes and undoing QRs on the wheels and seatpost. This really has my interest!! I would love to see more pictures and a pack out into a bag. I've built, ridden and owned a lot of small wheel bikes and the ones that are the most fun to ride have low bottom brackets and short cranks. Makes them feel fast and zippy! I love this exact bike and will be buying one for sure. I'd even pre-order one if there was an option. I'm already dreaming of 2 back wheels so I can go SS/fixed and geared...VERY exciting! Wish I had made it to Philly. this is probably your best bike design ever. Excellent thinking. FYI, a bike (or e-bike) built to carry one child in the back, commuting gear up front, and still fit within Seattle Metro's specs (under 46" wheelbase & less than 55lbs) doesn't seem to exist. 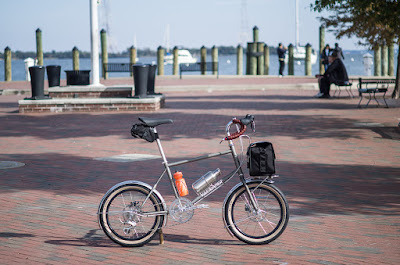 The Tern Vectron comes closest, but it can only carry 15lbs up front in a small backpack rack and the folding clasp is limited to 230lbs total weight, which means a 180lb man such as myself with commuting gear and a child seat can only carry a 1-year-old! Ug. 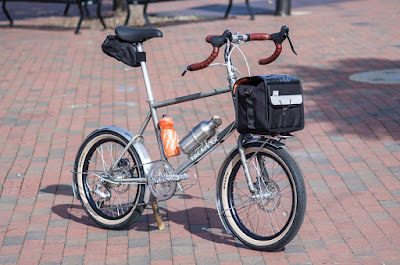 And yes, the Tern GSD can physically be placed on a bus rack, but it's 2" over length and very well beyond 55lbs. The Bike Friday Haul-a-Day just fits, but then you're in cargo bike land and it's still long and heavy relative to a diamond frame. The 20" platform is uniquely good for kid carrying also because of its low center of gravity. If you offered braze-ons capable of a rear rack, and I guess if a child-capable rear rack existed for 20" (maybe just buy a Tern rack? ), the only question is whether the frame handles well with the weight. Some child seats are capable of carrying a 80lb kid! Even if it's a bit flexy, there still aren't really any alternatives that satisfy those parameters. Anyways, figured this might be a use case you hadn't noticed. Carry on! Ah...it's alright...You've got the Dahon Dash & Dash Altena to compete with. Those have a diamond-shape geometry, ride very well, and actually fold. It would be better to mount the rack from the frame than fork. it would be slightly higher but still more stable. That can't be a real VO because it doesn't have an elegant fork with a French bend and a lovely crown. It's bit of an utilitarian initiative and looks it. We've tested the handling with our Randonneur bag and steering is easy and confident. We are currently trying a few cranks that we may spec on this bike. We want to ensure good heel clearance (arms that have a higher q factor), performance, and durability. Plus, it had to have road gearing. You will be able to use a front derailleur. The steerer is plenty long, verging on hilariously long. I wanted to use our Cigne Stem plus the Nouveau Randonneur bars for this build. We will probably bring in accompanying, full coverage fenders to work with this bike. Not really. The fender line will never be as good as a bike with vertical dropouts, but with a bit of skill and patience, it can be really good. We'll probably bring in fenders to work with this bike. You're a madman. I like your style. We haven't had any issues yet! It rides confidently and easily. We're going to test with other types of loads, but as with every VO frame, front load handling will be superb. You're right, it is a bit utilitarian. The radius of a bend required for a French style would be to severe in this case. It still handles exceptionally and is quite comfortable with the big tires! Since you're in prototype, I'd really like to see long chain stays. At-least long enough so you could tuck in a large chainring. With the 20" it would be cool if you could stuff in a 65t ring to keep your linear inches in tune with a 27/700cm tire. It's a start. Bike Friday currently makes some great riding 20" folding bikes (without the squirrely steering), road style or touring and you can get IGH and belt drive. Plus they pack without totally dismantling them. But this is a good start. If you're looking to beef one up for cargo uses, take a look at the Bike Friday Haul-a-Day with it's short wheelbase and super light weight and go from there. Right now, they have the best designs out there for small wheelers that ride like big bikes. In my experience a 56 large ring, coupled with an 11t cog, works quite well on a mini. Not quite the top end to match a 700c road bike, but rarely needed. I agree. Just look at how Brompton and Dahon do it. The mount is on the head tube, meaning steering is not affected. Also look at the Leaf series of Japanese E.B.S. minivelos. Yeap. A minivelo is not a proxy or replacement for a road bike, particularly this one which has 405 wheels instead of 451. You want to go as fast as a road bike, buy a road bike. It does minivelos and their market no favors trying to shoehorn them into the road bike mold, or to imbue them with the far too prevalent faster, lighter, narrower, lycra ethos of road bikes. You folks in North America need to get out more, and look beyond the BF. Asia-Pacific is replete with different folding bikes and minivelos. Against this world backdrop BF is hardly unique or a model to be emulated. Look around. It's a big world out there beyond Eugene and the West Coast. If those dropout compatible with Rohloff OEM spec that will be awesome! hey, abu. just saw a pic of your mixte mini...so, so very nice, indeed. i agree, look far for mini's...espesiaaly japanese mini's. bf is o.k. but can be sub par customer service. its a big mini world out there...currently diggin the v.o. prototype. cheers from florida. this looks so fun. unpainted raw frame would be a dream! Thanks. Btw & fyi, Bannard is/was from Taiwan. British long distance commuter here: THAT BIKE IS THE NUTS! ANY YOUR GOIMG TO DISTRIBUTE TO ENGLAND? ID DEFINITELY BUY ONE. it's Brompton or nothing in Blighty administration this is screaming: LOOK ATE BABY!! It has a nicely proportioned frame; the head tube doesn't look too long (unlike a lot of other mini velos). I'd be interested in getting one when they come out. Another thought occurred to me. It would be nice if you could give us the option of rim brakes also on frames.removable post mounts would be great. When the bike is disassembled, it will be able to be checked as regular baggage. We're in the midst of designing a case! Nice and with disc brakes too......Lovley jubley. Glad you're developing this. I was disappointed with the discontinuance of the Soma mini. I currently have both a Dahon (now a 1x10) and a BF Pocket Rocket. The PR is much more usable with a front derailleur, which allows a fairly tight cassette, but provides enough range. I have a huge cassette on the Dahon, so am between gears a lot. I’m so excited about this bike! I’m currently using a Bike Friday PakIt when I fly. I love it, but there are some odd things about the ride feel of a folding bike. I’d love to have a mini velo that I could fly with using an airline legal suitcse to avoid fees. I second (or third, fourth, or whatever we’re up to now) the request for head tube brazeons for luggage. How much disassembly would be necessary for this bike to pack into a suitcase for flying? Any chance it will be rim brake and disc brake compatible? I would love this in a single-speed version! 8-speed, room for giant tires like Cult AK bmx 2.5" (low psi for suspension), and pop on a riser bmx bar w gel grips and I'd have my own Hooligan commuter but with option for touring etc. later. Count me in. When is expected to release... cant wait to get one!